otoselkie Okay, I have an icon question: are portrait-maker icons (like the above) allowed for character icons? For those of us who don't own scanners? I know you're supposed to use your own art, but unless you want a trackball stickfigure, this is the best I can get right now. thanoodles Hello! I've got a little proposal to make to you guys and a few questions as well. Okay, so maybe it's not that urgent or anything, buuuuuut I think it's important for me to clarify something I failed to clarify before, and that is character location. Setting. For now I'm just going to assume that everyone lives in the same area, and since I believe (I could be wrong here, so correct me if I am) that Farai is the only character to date with a firmly established location, I think that'd be a good place to start. So shall we just assume that everyone is living in New York, then? He lives in the city, sooo...yeah. Let's start there. :) Unless anyone has any objections, of course. I'm open to other suggestions. So yeah. We'll just see how long I can stand logging out of my journal and logging back into this one just to post rp posts here will last. HA. Yeah, I'm impatient. I'll get over it. I think. PS - Feel free to start roleplay any time you'd like! Just because I'm not around/making rp posts doesn't mean you can't. Roleplay away! PPS - I'm looking for a co-mod to review and pass verdicts on apps, preferably someone who has some rping experience and is online more than me. I'm thinking Rave or Noodles? I dunno, I'm just going to be extremely busy over the next week or so, and I'm not sure how much attention I'll be able to pay to my baby, so I think I'll need someone to fill in for me. Thanks! | Mutant Powers: Sophie can absorb objects into her body by touching them and then disgorge them later. She carries their weight, however, so she can’t absorb anything she is not strong enough carry. She can also push her hands into objects, use them to anchor herself, but no farther than her wrists. | Affiliation: None as of yet. She would probably join one of approached, though. | Physical Description: Fairly pale skin, shoulder-length brown hair that she usually ties in a braid, plain face with a flat nose, and brown eyes. Can usually be seen wearing jeans and a tee-shirt (even in winter) and a multicolored polar fleece when the weather is cool enough. Sophie is thin for her age, and, while I wouldn't describe her as muscular, she's strong enough. | Personality: Extremely shy. Sophie is very quiet, and isn’t likely to be the first to speak in any situation. However, once she had decided on someone she will trust them without reserve – something that could easily get her into trouble. She could easily be manipulated by a friend or someone in authority (i.e. an older classmate) that she trusts. She will follow almost any lead. Sophie can keep her head in a tense situation, and she’s resourceful as well as a fast thinker. Strategy is beyond her though, I’m afraid, as are politics (at least when she herself is involved). Sophie has very little concept of the fact that she can be manipulated, and so would be an easy target. I could completely see her being tricked into doing something stupid or going onto ‘the other side’. | NPCs: Father, brother and mother. | History: Sophie grew up with her father, a University physics professor, and her brother, William. Her parents are divorced, and her mother, Margaret, lives nearby, working as a magazine editor. William and Sophie are a year apart in age and very close. Sophie lives with her father, but sees her mother on weekends. Sophie passed through elementary school without distinguishing herself academically – though she has always excelled at art. | Anything Else: I have no previous RPG experience. Ziltch. So please handle with care :). Do I need a separate journal for this? Or a 'Sophie' icon? Anything else you want up there? Mutant Powers: Purple ‘light’ (energy) blasts from hands, but it only affects living beings. She has retractable claws, cat-like eyes that can see in total darkness, fangs, heightened hearing, three times the strength of a normal human of her stature, and a nose that rivals that of most canines. She has the ability to link with her hawk, but can do no more than see through its eyes. Physical Description: Stands at 5’ 5” and has a trim yet muscular build. Though originally pale, her complexion is now somewhat dark, as if she had spent a lot of time in the sun. Her hair is long, reaching the middle of her back, and is black with silver streaks, and has an ‘untamed’ quality. Her eyes are like a cat’s, and vary in color from pale yellow to deep green based on her mood. She has normal human fingernails but, below those, has a set of retractable feline claws which extend to about 1 inch and are creamy white in color. Her ears are pointed but are usually hidden by her hair when in public. Her teeth are somewhat sharper than a normal human’s, but not so as to be noticed by a causal glance. She usually wears dark colors such as purples and reds. Normally she can be found wearing a skin-tight outfit with a pack on her back, and she also wears a long, animal-print coat. 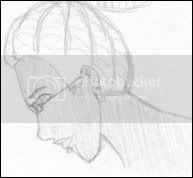 She has a gold hoop earring in her left ear, and a gold chain about her neck from which hangs a small bird pendant. She usually has a bandana tied ‘round her head. She does, of course, wear a special glove on her left hand for her hawk to perch upon. Personality: She tends to be suspicious of others, and is slow to trust. She’s somewhat antisocial and prefers to work alone, but occasionally makes exceptions. Her memory is not the best, and so she forgets things like names and the time of meetings on a regular basis. This only adds to her suspicious nature. On a deeper level, she is very ethical, if somewhat aggressive and overly willing to kill if she feels the victim deserves it. Once her trust is won, it stays won. History: She is the only child of two middle-class parents. Her powers manifested at age 12, starting with heightened senses. Over the course of two years she underwent the physical changes and started showing signs of her more obvious power (i.e. the purple light blast). Her parents, though afraid of these changes, did not love her any less but tried to find a way to make the strange abilities go away. She was home schooled from the time of the first obvious signs of her mutant power and so led a secluded life. Her only real friends were her pets, as her parents didn’t want the neighborhood children finding out that their daughter was ‘different’. Still, she had always been something of a loner so the isolation didn’t bother her much. At the age of 17 her feral nature began to take over. She started to react more with instinct and less with reason. Realizing that this behavior could prove dangerous to those around her, she ran away from home. Eventually she lost herself deep in the forests and taught herself to control those animalistic urges. While in the woods she came across a hawk’s nest with a single chick in it. Remembering how much she missed her old pets, she took the chick and cared for it. As the chick grew to adulthood, she realized that she could see through its eyes if she concentrated hard enough. She used this new-found power to hunt, and trained the hawk to ‘patrol’, ‘guard’, and ‘spy’. Having spent so much time and effort in training her hawk, she never bothered to see if she could link with any other creatures. Three years after running away, she was discovered by two poachers when they shot the deer she’d been stalking. Knowing that the men should not be in her territory, she allowed her feral side to take over. The poachers, too stunned to react in time, were killed by her blast of purple energy. The encounter reminded her that there was a world beyond the trees, and that she was lonely. Taking what items she could carry from the dead poachers, she called her hawk and followed the men’s trail back to their truck, and from there rejoined society. She went on to work as a free-lance assassin, though she made sure to only kill people who deserved it. She hid her powers and dropped her birth name, for fear her parents would find out she was working as a killer for hire. Instead, she now goes by the name she chose for herself. I tend to draw things...lots and lots of drawing. Mutant Powers: Rachel can freeze time for a short while and move around during that temporal stasis. She does not need to actively will time to continue to freeze, but after awhile the effect will wear off and time will start to move again. With experience, she will eventually be able freeze time for longer periods, but now she can only achieve a temporal stasis of about five minutes at most. If she doesn't return to the exact location and position she was when she stopped time when she starts time, it would appear to anyone watching that she spasmed into that new position - something like skipping a frame in a movie. Affiliation: N/A as of yet. Physical Description: She's Chinese and of slightly lower-than-average height (about 160cm). She looks rather nondescript and can blend in the background if she wants to. Her hair is black, long and at about shoulder blade length, and it's usually pulled back into a loose ponytail with an asymmetrical fringe sloping down towards the left. Um. Yeah, that's about it. She normally wears shirts, jeans and sweaters. Personality: Rachel is generally cheerful and friendly, but she's also shy, introverted and rather quiet. She's very analytical and never rushes into things, and thinks way more than she talks. She prefers listening to talking, and will comfortably fall into the position of follower if she is not obligated to lead. She will, however, take the role of the leader if she feels she has to (but won't be very comfortable doing so); more often than not she is a background player. She's very loyal and will doggedly defend and support those she loves. She's elitist, though, and unabashedly biased (although she rarely shows it). She dislikes change. NPCs: N/A. Actually, her dog. History: She grew up in Singapore (hehh, my country) and moved to America on her own when she was sixteen to study there. Now she lives on her own with her labrador retriever in a small but comfortable apartment, and has a lot of privacy which she likes. She keeps in touch with her parents and friends back in her home country, and has started to make friends in America. It was tough manifesting mutant powers in a foreign country all alone, as there was no one to turn to, but it also meant no awkward questions from parental units which was quite convenient. ♥ Mutant Powers: Sasha has the wonderful ability to control the nature of water and anything related to it [that means mist too]. Her codename is celtic for 'sea jewel'. ♥ Affiliation: None for now. ♥ Physical Description: Beacause teh Hikaru is lazy, here is a picture. ♥ NPCs: None at the moment, even though I listed she has an imaginary friend. >.>; Ssh! ♥ History: Sasha's mother and father died in a plane crash during a business trip and she was left in the care of her grandparents. These happy times soon came to an end when Sasha was taking a swim in their pool and happened to make a swirling vortex of doom that swallowed up her grandparents. Traumatized from this event she fled from her home to hide from the people she knew and loved. She hasn't completely controlled her powers and because of this is often afraid of herself. Soon to come: Hypnos and Sonata. But in the meantime, a couple sketches of Hypnos. Because I felt obligated to create the token bishounen. And because he's smexy. I need to come up with a civilian name for him. Any ideas? He's Jamaican, if that helps any. I'll write up his profile and Sonata's when I get the chance, whenever that may be. Jelani, Kato, Munashe, Nkruma, Sipho, Adisa, Amadi, Anan, Farai. Dara has two abilities combined into one. Not only can she produce flames from her finger tips, but can then manipulate the shadows cause by the flames. Other abilities include lighting fires with her mind. However, she can't light huge ones, only candles and the such, and also extinguish them as well. As for Darkness, she can meld instantaneously with any shadow and not be detected. ♥ Physical Description: Short, spikey pink hair, with long bangs that fade to purple and then to black. She's very tan due to Native American descent, and average height. Average build. No piercings. One tattoo on her neck that has yet to be figure out as to it's meaning. Often wears whatever's comfortable. ♥ Personality: Laid back, go with the flow. Her motto is most often "forgive and forget". She doesn't like to dwell on things because of her past. She'd rather be upbeat and happy then, sad and bringing everyone else down. In crowds she can be shy around others, though if by herself, she doesn't care. ♥ History: Dara's mom is Native American and Her father Irish. Odd coupling, but her mother met him on an extended trip to New York. Growing up with her family was fine. In fact her mom had had latent mutant abilities that she rarely used, so becoming a mutant wasn't all that bad. However, Dara had met a girl she loved dearly. She had been afraid to tell her parents, and when they found out she was kicked out. They still keep in touch, But Dara thought it best to go out on her own and do what she could for herself. Her flame abilities were her first mutation. Normally the second wouldn't come to much later, but this stressful experience, and her always wanting to hide, brought about her shadow mutation. Being by herself in an apartment and working part time at a video store, she's learned, tested and developed her abilities. Well, I should be posting a sample app of one of my characters soon, which I shall be rping with whoever shows up. If it's just me and Noodles, I guess that's fine, too. We haven't rped our characters in a very long time.